Porcelain dental veneers can be an excellent treatment option for patients seeking to improve the appearance of stains, chips, gaps, and a number of other perceived tooth imperfections. At Innovative Dental, we are dedicated to utilizing the latest dental technologies to ensure you receive the most comfortable and successful treatment in a safe and efficient manner. Dr. Grant Olson, our experienced cosmetic dentist, has received extensive training with CEREC® same-day restorations and is one of only 300 Mentors worldwide who has completed the core CEREC® curriculum. 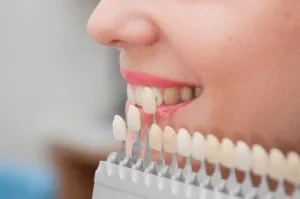 Using this advanced technology, he can customize your porcelain veneers to resemble the look and feel of your natural teeth, all while providing you with highly-durable, long-lasting results. In just a single office visit, Dr. Olson can design and secure your custom veneers, enabling you to walk away with a new, beautiful smile on the same day as your appointment! If you are interested in porcelain veneers and would like to schedule an appointment with Dr. Olson, please contact Innovative Dental today. 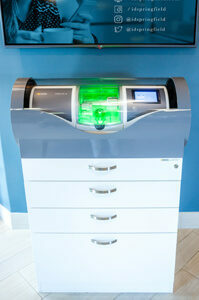 At Innovative Dental, porcelain veneers are always custom designed and fabricated in one visit using CEREC® technology. This cutting-edge approach to cosmetic dentistry treatment can effectively revitalize your smile by improving both the form and function of your teeth with virtually no discomfort or downtime after treatment. Additionally, veneers are designed to be maintained through routine oral cleaning habits, and they can last for decades! 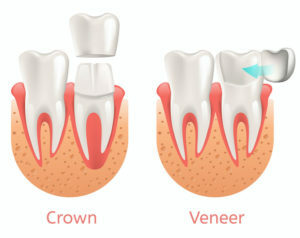 What’s the Difference Between Porcelain Dental Veneers and Crowns? Although porcelain dental veneers and crowns can be used to address many of the same concerns, the two treatments are generally recommended in different situations. Due to the fact that porcelain veneers are designed to cover only the front, visible portion of a tooth, they are typically more appropriate when concealing imperfections on teeth that are otherwise in strong and healthy condition. Conversely, dental crowns are made to “cap” an entire tooth, providing both structural and aesthetic restoration. As a result, crowns are usually the better option for treating—or even replacing—teeth that are significantly damaged or decayed. At the time of your appointment, Dr. Olson or Dr. Megan can explain more about the differences between crowns and veneers and help you determine which treatment would be most beneficial for your unique needs and goals. What Does the Porcelain Veneers Procedure Entail? Our doctors are dedicated to ensuring your porcelain veneers procedure is as comfortable and efficient as possible. In fact, the entire process from design to implementation can be completed at our office in a matter of hours. To begin the process, we will scan digital impressions of your teeth and then utilize the CEREC® 3D software to design your veneers with the highest degree of accuracy possible. Following their design, your porcelain veneers will be precisely milled with CEREC® technology in the convenience of our office while you watch television, read a magazine, or simply rest your eyes. Once constructed, our doctors will secure your custom veneers and match their color to your surrounding teeth. After a final polish, you will be ready to leave our office with beautiful, long-lasting results that will make you want to smile! Once your porcelain veneers have been placed, they do not require additional maintenance beyond routine brushing, flossing, and regularly scheduled dental cleanings. While the porcelain material itself will never stain or decay, it is important to remember that the underlying tooth structure is still susceptible to these issues, the latter of which can ultimately lead to veneer damage. As a result, maintaining good oral hygiene habits is essential to prolonging the longevity of your veneers. When properly cared for, porcelain veneers can last many years. In fact, our patients often find that their porcelain veneers last decades when they follow a good oral hygiene regimen and receive professional teeth cleanings as recommended by our dentists. At Innovative Dental, the total expense of porcelain veneers treatment will vary based on several factors unique to your specific case, including how many veneers are needed and whether or not any preliminary dental care is required to improve overall oral health prior to veneer placement. Additionally, some dental insurance plans provide coverage for veneers, which can significantly alter the price of treatment from one patient to another. When choosing a dental practice for porcelain veneers, it is important to keep in mind that cost is often reflective of the quality of technology and materials employed, as well as the credentials, skill, and experience of the cosmetic dentist. Consequently, a lower price point should never be the only factor used to select a provider, as this may potentially lead to suboptimal treatment and/or results. We never want pricing to prevent our patients from receiving a beautifully enhanced smile with porcelain veneers, which is why we partner with several trusted healthcare lenders to offer dental financing options that can fit virtually any budget. If you are interested in payment plans for porcelain veneers, a member of our staff will be happy to help you review your choices and get you started on the application process at the time of your visit. For more information about porcelain dental veneers, or to schedule an appointment with Dr. Olson or Dr. Megan, please contact Innovative Dental today. Our friendly staff will be happy to help you in any way we can.